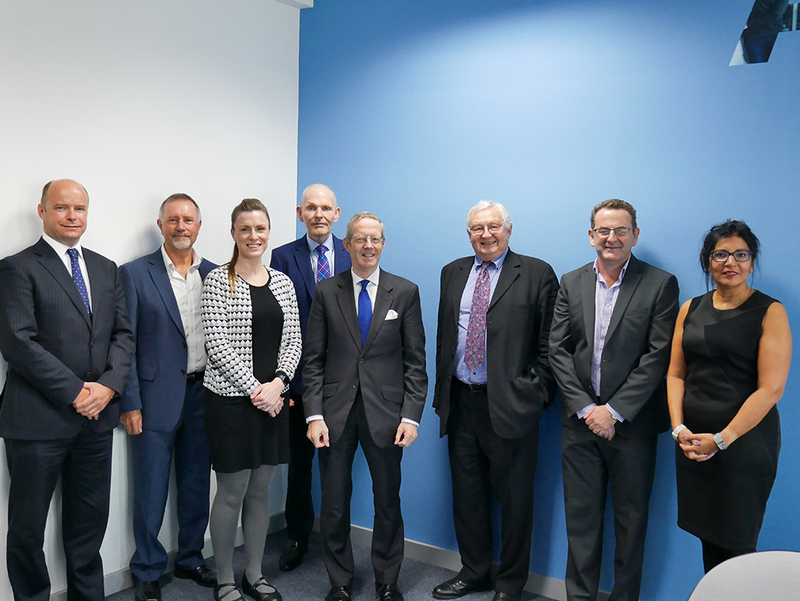 In advance of the Autumn Budget announcement, the South West Business Council was delighted to host a meeting with Mike Cherry, FSB National Chairman. The meeting was held on the 19th October at Plymouth Marjon University. Mike is pictured with members of the SWBC Board, plus Dr Emily Beaumont, Nina Sarlaka and Ashley Beare. “Today the Chancellor has shown that he is now listening to the small business community. By acting on FSB’s recommendations for high streets, VAT and the Employment Allowance, the Treasury is set to provide some much-needed lifelines for thousands of small firms. “Complying with the burdensome Value Added Tax (VAT) regime costs the average small registered business a working week every year. That’s time that should be spent growing their firms. Suddenly dragging more small firms into the burdensome VAT system would have risked a real shock to the economy at an uncertain time. The Chancellor’s decision to freeze the £85,000 turnover threshold for VAT registration until 2022 has saved the business community from disaster. “Apprenticeship starts have plummeted over the last year following the introduction of burdensome co-investment costs for small firms who want to bring young people into the workplace. Dropping the proportion of apprenticeship training costs footed by small firms from 10 per cent to 5 is a much-needed development which should go some way to arresting the shocking decline in apprenticeship starts. If we want parity of esteem between vocational and academic routes into the workplace, we need to incentivise small firms to take on apprentices. Today’s announcement marks a step forward. “The Employment Allowance is a vital incentive that’s helped more than a million small firms create jobs, increase pay and invest over the last year alone. It’s good to see the Government keeping the allowance in place, directing it towards the small employers where it has the most impact. “This Government’s relationship with the self-employed community has been a mixed one. However, the Chancellor has rightly responded to our calls for greater funding for training within the self-employed community. We look forward to delivering the £10 million self-employment training pilot scheme announced today in Manchester. “It’s good to see that the New Enterprise Allowance programme will be continued. This initiative has helped more than 100,000 unemployed people start firms. It’s exactly the kind of programme that a pro-business government should unequivocally support. As is the Start-Up Loans company, so it’s good to see the Government extending funding for this crucial part of the British Business Bank. Equally, it’s encouraging to see the Government starting to address the many aspects of Universal Credit that do not work for the self-employed. Far more action is needed in this space. “Extension of the IR35 rule changes that have taken place in the public sector to the private sphere must be handled with caution. Careful consideration must be given over the next two years as to how this potentially damaging roll-out should be managed. The flexibility of our workforce is one of our economy’s greatest strengths – one that should be protected. “Small businesses on our high streets that cannot get Small Business Rate Relief will be delighted with the significant discount for the next two years, which on average will help these businesses to the tune of almost £2,000 each, but potentially up to around £16,000 off small businesses facing the biggest bills. “Our creaking infrastructure is holding back too many small firms – draining their productivity and preventing them from joining the digital revolution. Nine in ten small businesses say a properly funded road network is important to their success. Crucially, they want to see to see a greater focus on ensuring local roads are fit for purpose. The £420 million of new funding dedicated to tackling the scourge of pot holes is an important intervention. Pot holes are a menace to small business owners and shoppers alike, and we look forward to more funds heading in this direction.